what's cooking in my tuscan kitchen: Pasta and Peas: the perfect spring meal! 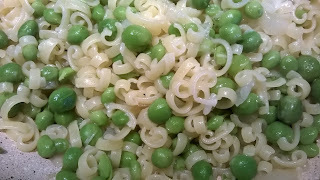 Pasta and Peas: the perfect spring meal! When my mom was a little girl growing up on Iseminger St. in the heart of Philadelphia's Italian neighborhood, the week's menu was centered around pasta dishes. I think she once told me that Wednesday's menu was Pasta and Peas. Today, I went to the open air market. Unlike most open air markets in Italy, the Lucca market has very few food stalls. But, as you turn onto Via dei Bacchettoni, the very first stall is run by a small local farm. 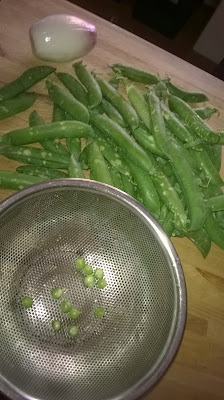 As I walked by I noticed that they had fresh peas, so I stopped and bought about 3/4 of a pound. I also bought some strawberries! 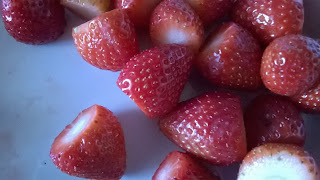 So, even though it's Saturday... today we had Pasta and Peas and strawberries for dessert! Extra virgin olive oil, salt and pepper, Parmesan cheese. This is a real quick recipe. Shuck and rinse the peas. 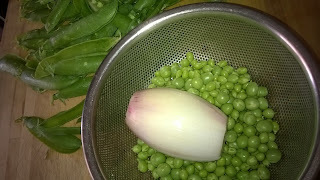 Then, before you start, put a large pot of water on to boil for the pasta. 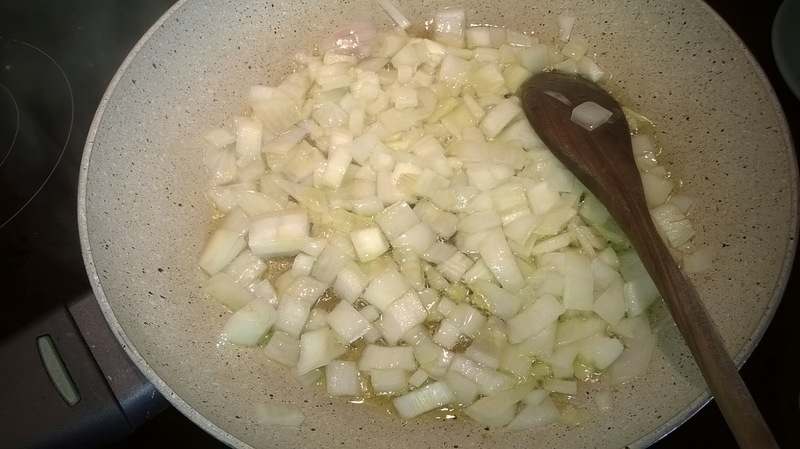 Chop the onion and put it in a non-stick fry pan with about 2T of extra virgin olive oil. Saute over medium high heat just until they start to become translucent. When the onions are translucent, add the peas, a pinch of salt (don't over salt, the pasta will be cooked in salted water), freshly ground pepper and a 1/3 cup water. Bring to a boil, cover and let it cook over medium heat for about 10 minutes. By now the water is boiling. 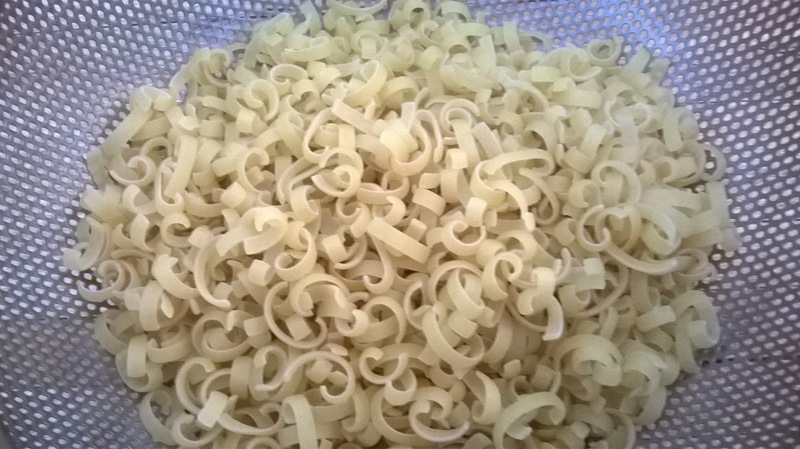 Salt the water as you usually do when you cook pasta. 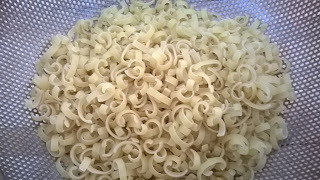 Throw in the pasta - I used a pasta called "Ricciutelle" - little pasta curls. You can use small elbows, shells or bowties. Cook until "al dente" - it should still be a bit firm. 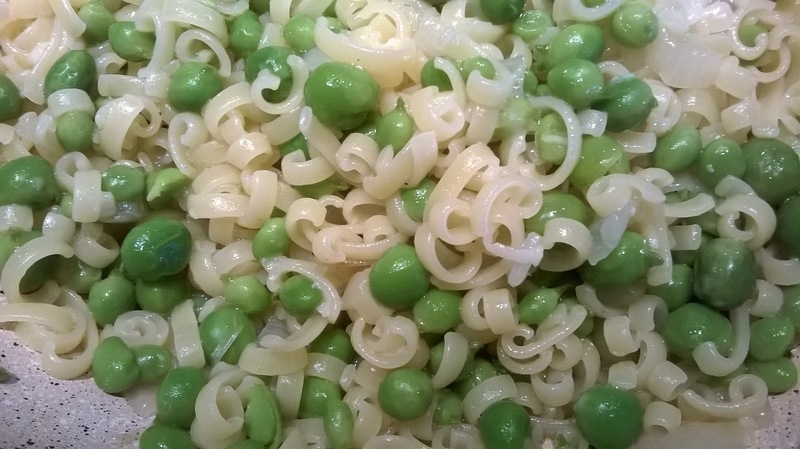 Drain and add the pasta to the peas. 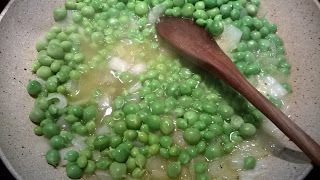 Add 1T extra virgin olive oil, about 1/2 cup of freshly grated Parmesan cheese. Turn the heat to high and toss to mix well. This whole process should take a minute or two. That's it! If you like pepper, add a little more freshly ground pepper and... BUON APPETITO! And... don't forget to serve strawberries for dessert!